When you hear the word ‘superfood,’ you probably think of blueberries, chia seeds, or leafy green vegetables. While those foods certainly contain a lot of vitamins and minerals, recent studies show that fermented foods–like yogurt, kimchi, and kombucha–can play a key role in mental health. Why? Fermented foods contain lots of beneficial bacteria, which contribute to your microbiome. A healthy microbiome helps you digest the food you eat–gut bacteria play a major role in healthy digestive functioning. For example, gut bacteria control how our bodies respond to carbs (specifically, how likely it is to turn them into fat). But the effects of our microbiome reach far outside our guts themselves. 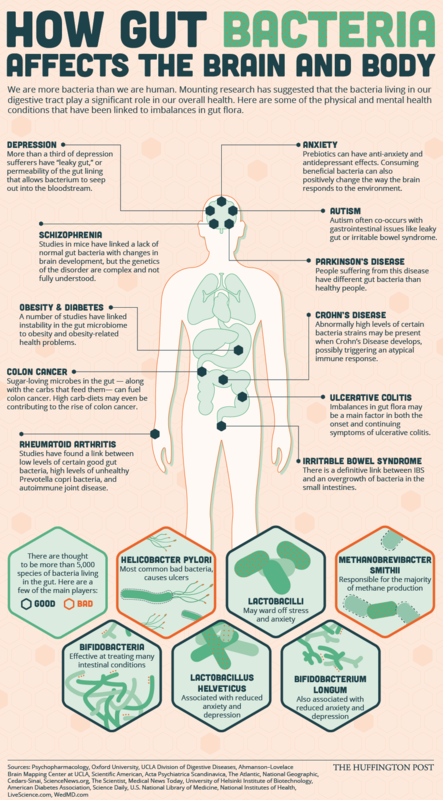 Gut bacteria are key players in your immune system, weight, memory, and even mental health . Probiotics (gut bacteria supplements) have been shown to decrease anger, depression, and distress. That isn’t exactly surprising once you learn that a whopping 95% of the body’s supply of serotonin (a critical mood-regulating neurotransmitter) is produced by gut bacteria. With gut bacteria, diversity is key. That’s why eating more fermented foods (which contain lots of good bacteria) as well as prebiotics (basically food for your bugs) boosts your microbiome. -Kefir: basically drinkable yogurt, this stuff is the best. It’s kind of like drinking ice cream, if ice cream were good for you and totally different than it is. We recommend Best-rated Organic Pastures, Meadow Creek, and Wallaby brands–although there are lots more delicious and sustainable types to try. -Kimchi: crunchy in *all* the right ways. More than an awesome Korean condiment, kimchi is a stellar choice for your gut because it not only contains probiotics, but prebiotics in the form of cabbage. It’s easy to make your own, but there are also a host of Best, Great, and Good rated options in our app’s database. -Prebiotics: remember to feed your bugs! Garlic, onions, leeks, bananas, and asparagus all have high levels of the dietary fiber gut bacteria feed on. So take a deep breath, a big sip of ‘buch, and get relaxing!